I was born in Milwaukee, Wisconsin, but I moved away when I was really young. I’ve had a tough time shaking my roots though, so I still have an extreme passion for the Midwest. The people are incredible, the beer is awesome and you simply can’t beat the food. That’s why I was so excited to learn about Zayda Buddy’s in Ballard. It’s a taste of the Midwest in the heart of the Northwest. The restaurant’s full name is actually Zayda Buddy’s Pizza (5405 Leary Ave. N.W. ), and it’s described as “Minnesota-style pizza and beer.” There’s a rich family history behind the place, but it’s too long for me to breakdown on here. I encourage you to click here for the background on Zayda Buddy’s though, because it explains why this place is what it is — a haven for Midwesterners. 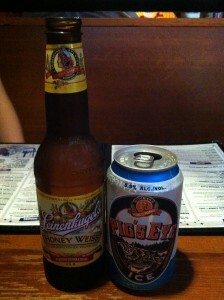 You can sense the Midwest feel the second you walk in the door at Zayda Buddy’s. There are posters for the Minnesota Vikings, Green Bay Packers and even the Minnesota North Stars (Zayda Buddy’s is considered “Seattle’s hockey headquarters”). There are also signs and pictures that showcase fishing (a time-honored tradition in the Midwest), other outdoor activities and Midwest wildlife. It honestly looks like a bar/restaurant you’d find on one of the many lakes in the Midwest (with some Seattle flair mixed in). I’ll say this right now: the food options at Zayda Buddy’s goes well beyond pizza, and the beer selection reaches far outside of Minnesota. While there is a long list of Minnesota brews, there are also beers from Wisconsin (they offer every type of Leinenkugel possible), Michigan, Missouri, and also plenty of choices from the Northwest and around the globe. 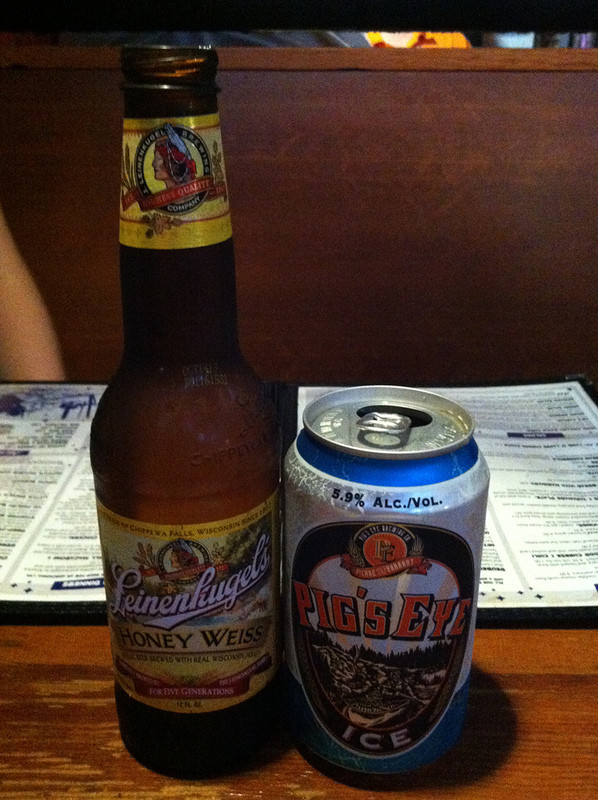 I ordered a Pig’s Eye Ice (from Minnesota), while Tove went for the Leinenkugel’s Honey Weiss. On top of the beer selection, there’s also a long list of specialty cocktails at Zayda Buddy’s. 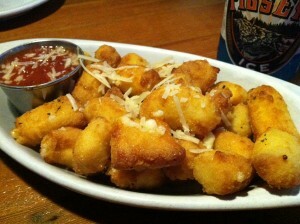 Not only does Zayda Buddy’s make Midwest-style food; they make real Midwest food. They import their cheese curds and bratwurst directly from Wisconsin, and they have walleye (a popular Midwest fish) delivered to Seattle from Minnesota. Zayda Buddy’s is legit, folks. If you want a real taste of the Midwest, this is the place to go. I’ve honestly never had such a difficult time choosing something off a menu. It’s not because there aren’t enough good choices at Zayda Buddy’s; there are too many good choices instead (the waitress literally asked me if I needed to flip a coin). Tove and I pulled the trigger on fried cheese curds and green bean casserole for appetizers, which we devoured like we hadn’t eaten anything in three days (even though we had eaten plenty). And then for dinner, I went with the Minnesota Walleye Fish Fry, while Tove tried the Tater Tot (a baked beef hot dish topped with tater tots and cheddar cheese — basically a tater tot casserole). Menu items at Zayda Buddy’s also include soups, salads, sandwiches, burgers, hot dogs, brats, and (of course) pizza. Fun stories like that add to the already awesome character of Zayda Buddy’s. Tove and I found ourselves reading the different stories behind many of the meals simply because they’re entertaining. It’s one thing to be a family owned restaurant, but it’s another thing to share so much family history and downright family pride. It’s something that makes Zayda Buddy’s really standout. 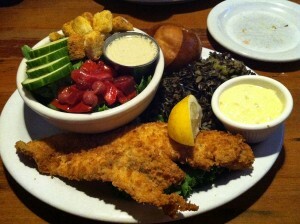 The Minnesota Walleye Fish Fry at Zayda Buddy’s was everything I’d hoped it would be. It took me back to the Friday night fish fries I’ve enjoyed in the past with my family in Green Lake, Wisconsin (where many of my aunts, uncles and cousins still call home). 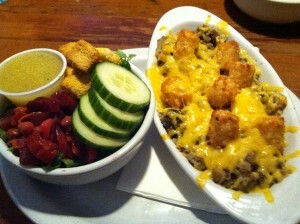 Plus, the portions at Zayda Buddy’s are huge. You get a huge slab of walleye with a side salad and a large helping of wild rice. Tove also really enjoyed the Tater Tot. Just like me, her meal reminded her of old times. One of her former college roommates (from North Dakota) used to make tater tot casserole for everyone when she was homesick. There was so much food on Tove’s plate at Zayda Buddy’s, she needed to bring half her meal home for leftovers. Even though we were full to the brim, Tove and I decided to order a slice of the homemade strawberry red velvet cake for dessert. We took it to-go and finally devoured it after our stomaches settled at home. The cake, which was coated in chocolate and served with vanilla ice cream, was delicious. 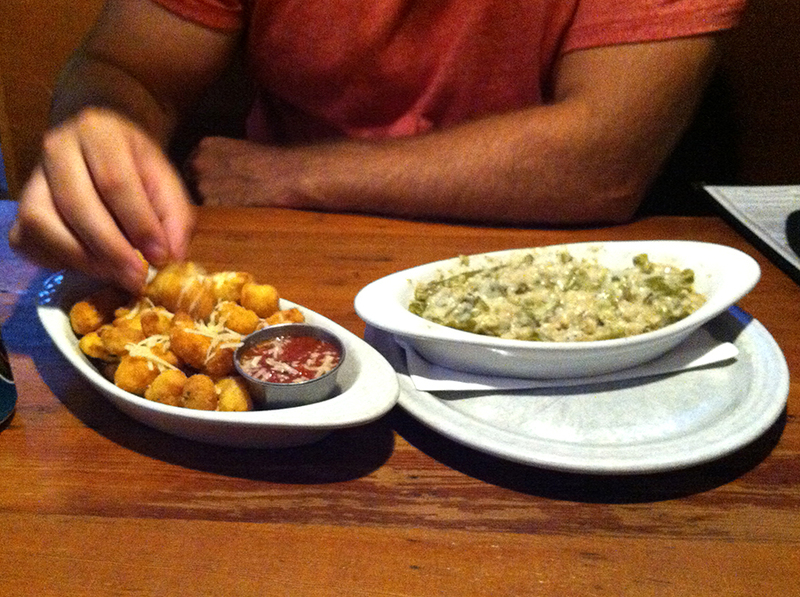 Even though it was an hour or so later, it was a perfect way to wrap up an awesome meal at Zayda Buddy’s. If you’re from the Midwest — welcome home. Zayda Buddy’s should be your new best friend. If you’re not from the Midwest, it might be hard to understand how incredible Zayda Buddy’s is. I’ve honestly never been so excited to write a food post in my life. Trust me when I say, this place is worth checking out. They serve breakfast, lunch and dinner. Take a break from the same old, same old and try something new and different at Zayda Buddy’s in Ballard. 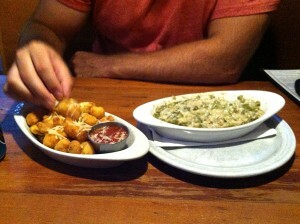 Have you ever eaten at Zayda Buddy’s? How was your experience? What did you order? We’d love to hear from you! Please leave your comments below or connect with us on Twitter, Facebook and Google+. 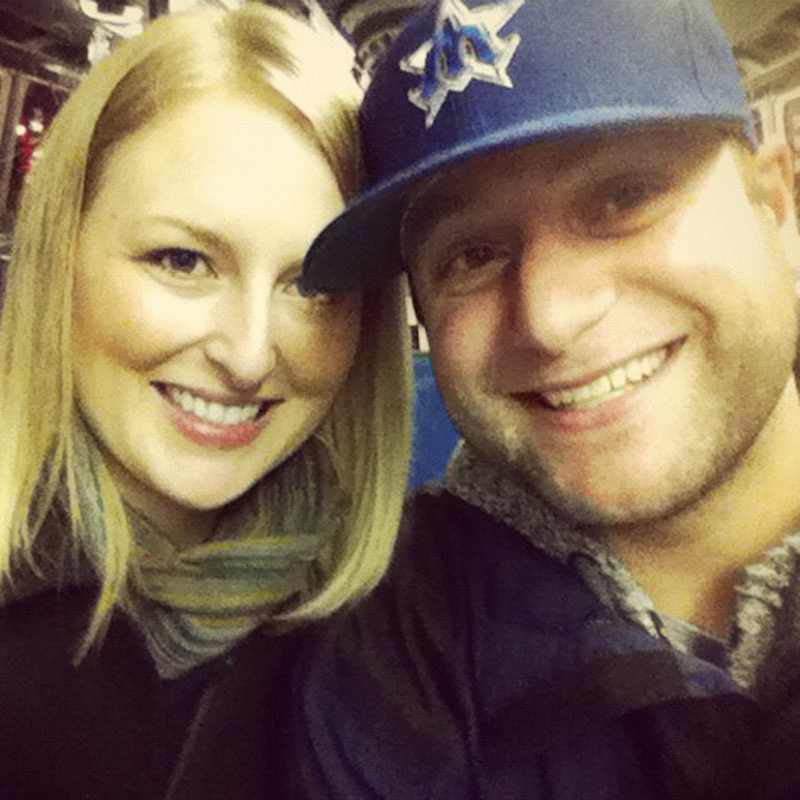 Don’t forget to also check out Seattle Bloggers for more great places to eat and drink in the Emerald City!